14 year old Demetria Cruz was reported missingon Saturday night, January 12; however, was last seen at 6:50 am on January 9 before leaving for school. The only contact from the missing girl was a Facebook message from Cruz that said “Mommy”. Demetria Cruz suffers from mental health issues. Police say Cruz was last seen at 6:50 a.m. on January 9th before leaving for Freedom High School Votech. She was wearing blue jeans, a white shirt and a denim vest. On January 10th, police say Molina received a Facebook message from Cruz that said “Mommy” with a geotag indicating the message originated from 4th Street in Allentown, Pa. 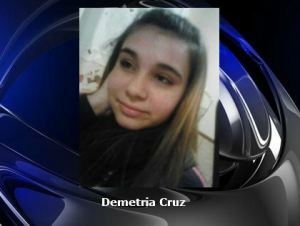 Anyone with information on Demetria Cruz is asked to call 610-865-7187.